Continuing the recent trend of aventurine dials, Arnold & Son has released the HM Perpetual Moon Aventurine watch, limited to 28 pieces. This style of wide-aperture moon phase watch has really grown in popularity over the past few years, with brands keen to reinvigorate a classic, if somewhat esoteric, complication. I personally love moon phase complications because the mastery of the complication is a challenge that exists mostly for its own sake. 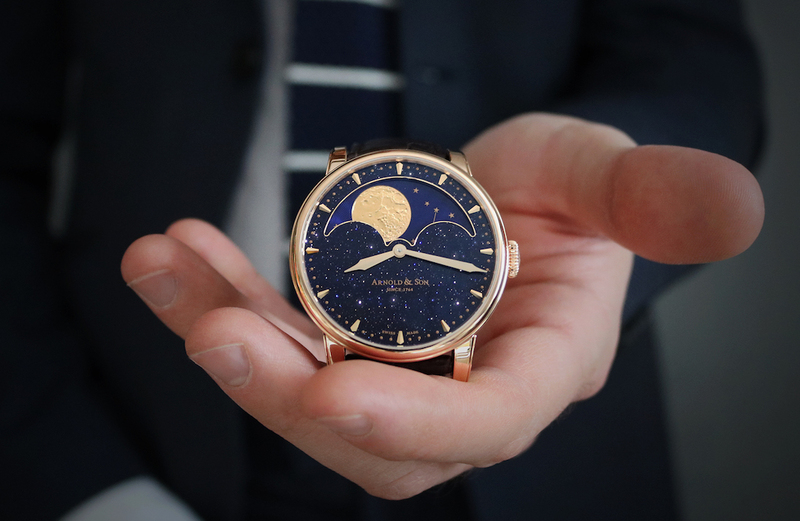 As a result, the moon phase complication is somewhat representative of the industry en masse. And that’s exactly what I like about it. 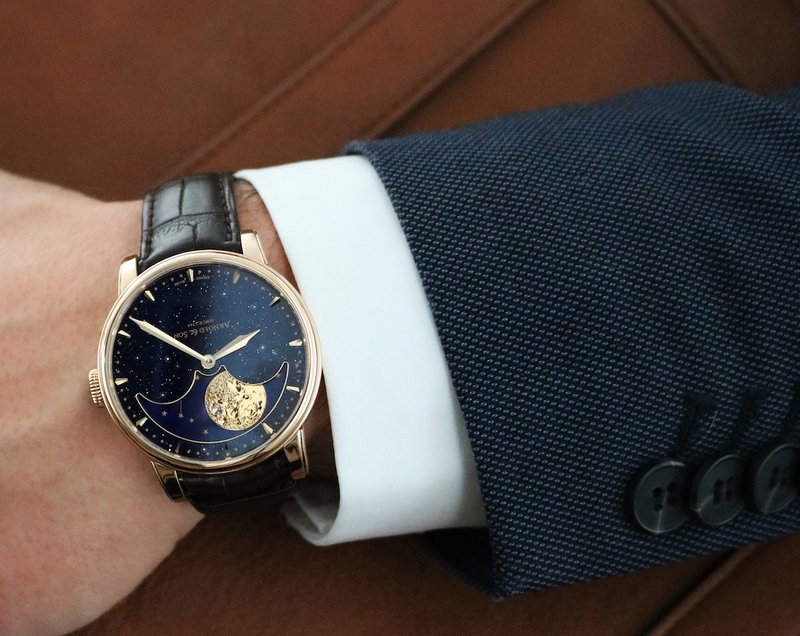 Moon phase complications are a microcosm of modern mechanical watchmaking. And they look really pretty, too. Crucially, the dial of the Arnold & Son HM Perpetual Moon Aventurine watch is described as “aventurine stone,” as opposed to aventurine glass, which is the cheaper, more stable material often used in watchmaking. 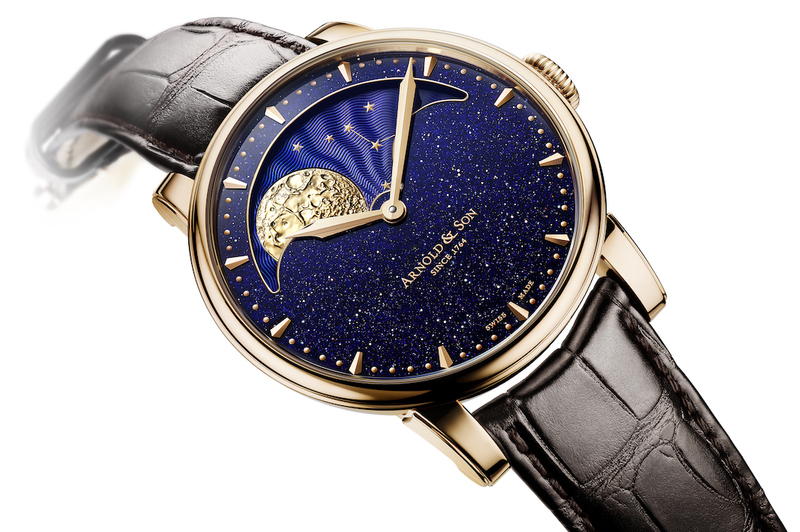 A deep blue guilloché pattern decorates the moon disc. The colors of the disc, the aventurine, and the 42mm, 5N red-gold case work fantastically well together. The brand’s British history inspired this design; consequently, the chosen palette certainly has a regal feel to it. Relatively stout lugs increase the wearability and dressiness of this watch. In some kinds of light — especially that used for the lifestyle shots you see featured in this article — the watch appears more yellow-gold than red. That said, the watch looks equally attractive, to my eye, in both hues. Perhaps even nicer in the real-life imagery, as opposed to the renders. The moon disc is a staggering 29mm in diameter. The moon occupies 11.2mm of real estate, itself. Unsurprisingly, Arnold & Son has chosen to draw so much attention to the complication because of its accuracy. 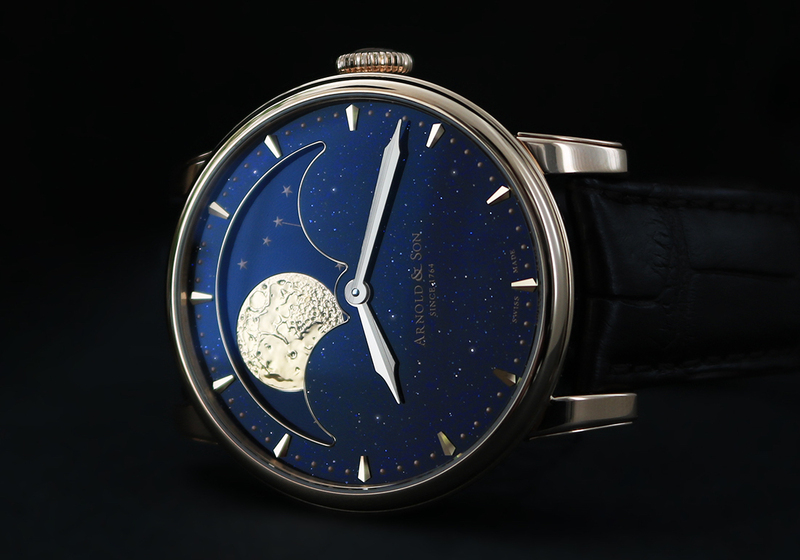 The Arnold & Son HM Perpetual Moon Aventurine watch will find itself just one day out of sync every 122 years. Upon correction, the watch will remain in sync for another 122 years. Thanks to the simple pusher, requiring just a single depression, the correction mechanism is incredibly straightforward. 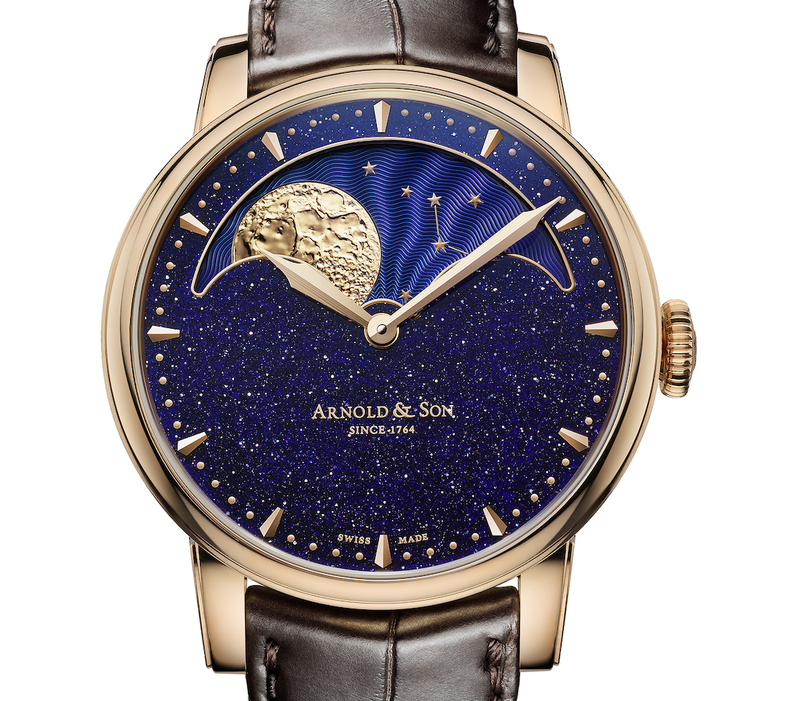 The Arnold & Son HM Perpetual Moon Aventurine is powered by the exclusive hand-wound A&S1512. An integrated moon phase complication helps achieve the relative slimness of the movement, which comes in at 5.35mm. Handsomely finished, the twin-barrelled, 21,600vph A&S1512 offers an impressive 90-hour power reserve. The use of the word “exclusive” when referring to this movement pegs it as proprietary, not in-house. The unusual addition of a second moon phase tracker, visible through the sapphire display back, facilitates the easy correction system. Neat little touches like this add up when designing a new movement, and even if Arnold & Son didn’t make it themselves, it is made for them and them, alone, by a specialist who understands the craft. I think Arnold & Son has done well with limiting the production of this piece. It was certainly a smart move to keep the numbers low. 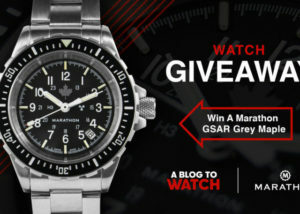 It’s a crowded market for this style of watch and an even tougher realm for watches at this price-point. 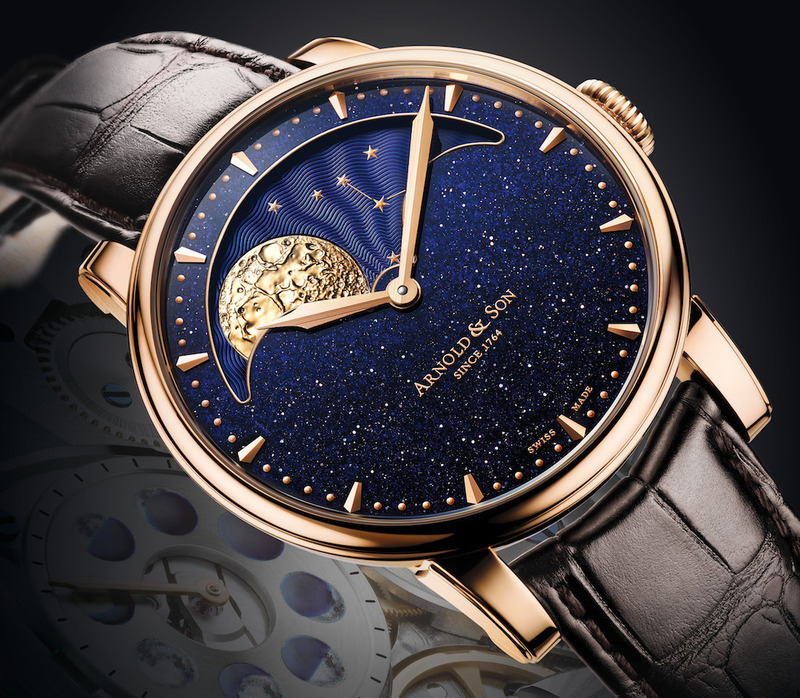 The 28-piece limited run of the Arnold & Son HM Perpetual Moon watch will retail at $33,650 per unit. Visit arnoldandson.com to learn more. 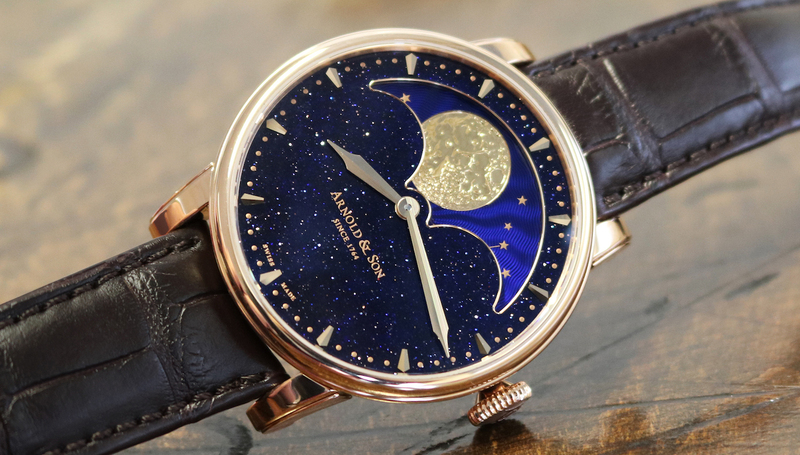 Pretty watch, and I like moonphase complications, but the aventurine dial is a little too busy and glittery and a little too feminine for my tastes. Wow. Two of my favourite features executed exquisitely. A lovely moon phase and gorgeous crown. The devil is in the detail and this is faultless. Sometimes I wish I had been born rich instead of well hung. To my eyes, the aventurine is much too busy and distracts from the lovely moon disk. In these images, the colouring of the aventurine also clashes uncomfortably with the enamel guilloche – maybe in real life (in which I will almost certainly not be able to judge) it works better, but I suppose that is always going to be a subjective matter. In any case I much prefer the original versions with matching enamel guilloche on the moon cutaway and main dial. One of those watches that you probably have to see on your wrist to really decide if all of the elements come together or not. 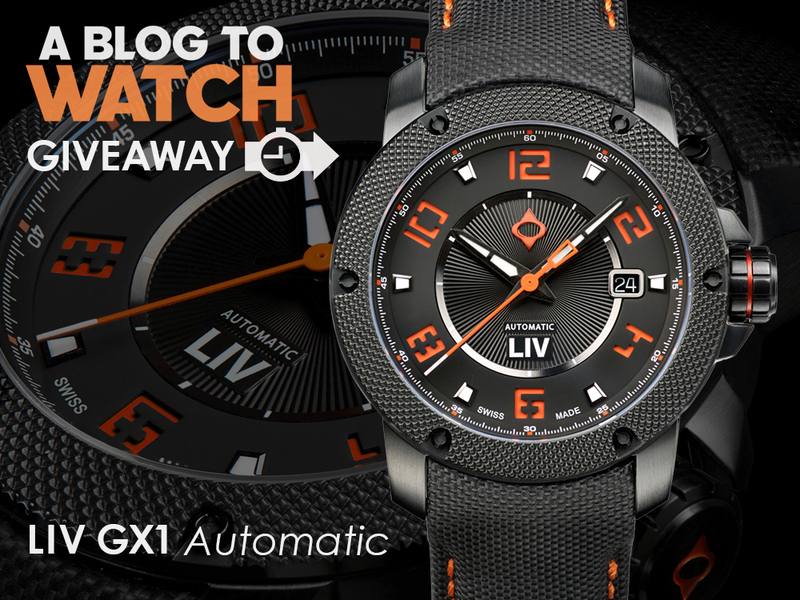 While not cheap, it may not be overpriced for what you are getting (A&S are definitely exclusive and well finished watches). Just beautiful. Would love to wear this on my next holiday. The only thing I’d change about this watch is removing the “Since 1764” from the dial and placing it on the back. Also, hopefully A&S follows tradition and releases this in steel for around half the price, $15k – $18k is worth it for the dial alone. Start booking tickets to Russia. I like the steel ones either black or blue because the moon is silver. I do not like golden moons. They do not look the moon. 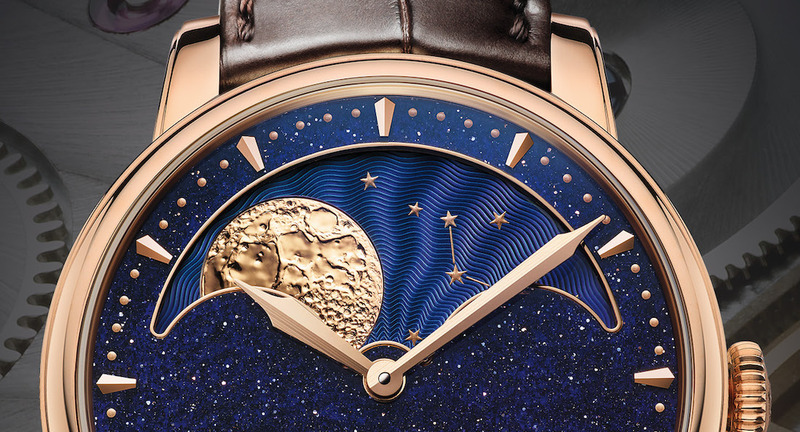 Stunning dial and love the textured moon but red or yellow gold don’t do it for me. White gold, platinum or even steel and it would be better for me.